Yes, it's December and freezing out, but I'm not deterred. 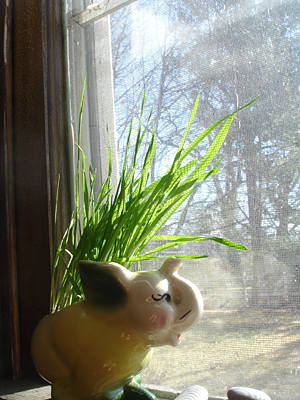 If you need a little green, it's really easy to grow your own cat grass on a sunny windowsill, anytime of year. 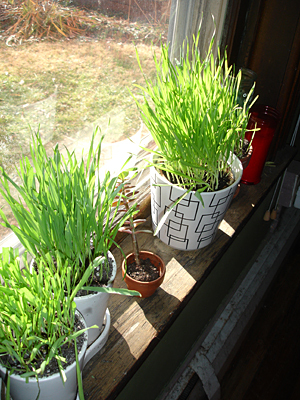 Renee’s Garden Seeds makes a seed pack of Mixed Gourmet Greens for Cats, which features a great blend of organic rye, oats, barley and wheat grass that’s perfect for cats (and will prevent them from attacking your houseplants). So, I gave it a go and put them in a nice sunny window. They grew voraciously (i mean, like, Jack-and-the-Bean-Stalk speed once they sprouted) and within weeks I had bright green shoots that were so welcomed with all of our Zone 6 dormancy. The packet made a lot of greens, so I was brought a few pots around to friends houses to liven up their winter after our last snowy day. My friend Marilyn’s cat Kato (the king of cats), pictured above, loved chowing down on his fresh pot of greens. Although carnivores by nature, cats crave fresh greens to keep their digestion in check, which is why some tend to go after houseplants. It’s now been about three weeks since our cat greens sprouted and and they are still growing strong (despite a few mowings). It’s amazing how fast they grow. Kids will love watching it too, since it’s pretty magical in the dead of winter. I like to put mine in fun planters, and put them around the house.